Saturday's draw between the Montreal Impact and New York City FC didn't sit well with either team considering what was on the line. 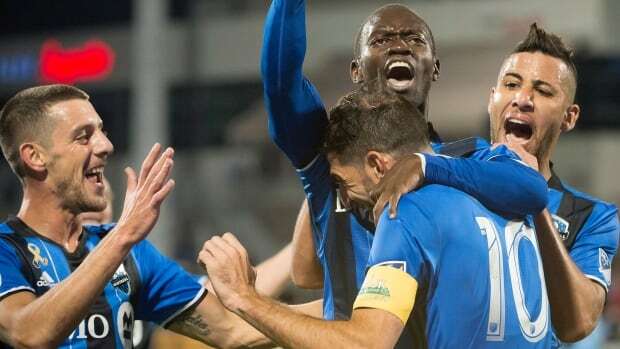 Midfielder Micheal Azira scored a game-tying goal in the 27th minute as the Impact held on for a 1-1 draw against New York City FC on Saturday. Montreal (12-14-4) defender Rudy Camacho gave the visitors an early lead when he scored an own goal. But the Impact tied the game 10 minutes later, thanks to a strike from Azira. Impact goalkeeper Evan Bush couldn't keep a clean sheet, but was crucial for the home side with four saves. Despite earning a point against a top Eastern Conference team, Impact manager Remi Garde says his players were "disappointed" with the result after the match. "I think it's a fair result," Garde said. "We had chances in the second half but I don't think we played well enough to say that we should have won that game." "Everyone wanted to win and we didn't win," Impact defender Daniel Lovitz said. "I think we generally weren't happy with not winning against a team like that. [NYCFC's] been a team that's been at the top of the East since as long as we can remember." Even Azira, who "felt good" after scoring against NYCFC, couldn't help but lament the lost points against a potential Eastern Conference playoff opponent. "We will take a point," Azira said. "But when you're playing at home it's always good to get three points. Tonight, we wanted to get a clean sheet. That didn't happen but at least we got a point. We stay in the race for the playoffs so we have to keep on pushing,"
In the visitors' locker room, NYCFC felt they left points on the table. "It was an important point, but what we've been missing in the last games is a win," NYCFC's Jo Inge Berget said. "It was a good game and we got a good point, but still we didn't get the win that we came here for." The Impact remain in sixth place in Major League Soccer's Eastern Conference. Montreal is five points ahead of seventh-place D.C United, who have two games in hand. The Impact have picked up points in four of their last five matches, but still need all the points they can get to maintain their hold on the final playoff spot in the East. Meanwhile, New York City FC (14-8-8) is third in the conference and needed a win to clinch a playoff berth for a third straight season. NYCFC is winless in their last six matches, with their last win coming Aug. 12 against Toronto FC.